That one never gets old. Well, yes it does, but, like wearing green on St. Patrick’s Day and being disappointed by the Oscars broadcast, it’s kind of a tradition. If there’s a jar of urine in the fridge, you have to warn your family not to accidentally drink it. Why is there pee in my fridge? What, there isn’t pee in your fridge? Weirdo! Thank you, Google Image, for continuing to make dreams come true. There isn’t always pee in my fridge. But four or five times a year, my youngest daughter has to travel to Montreal for regular medical appointments that include blood work, sometimes an ultrasound or other peekaboo tests and urine analysis. Abby has tyrosinemia, a rare metabolic condition that involves her inability to process the protein tyrosine and is far too complicated to explain here. Because she was born in Quebec, where there is a higher incidence of the disorder than anywhere else in the world (vive la maladie! ), Abby was diagnosed at 9 days old. She’s 11 and a half now. That’s a whole lot of pee. I don’t want to go into too much detail about how we’ve collected the urine through her childhood because she may read this someday, and the vague infant memories of plastic bags and surgical tape may already be cause enough for future therapy. 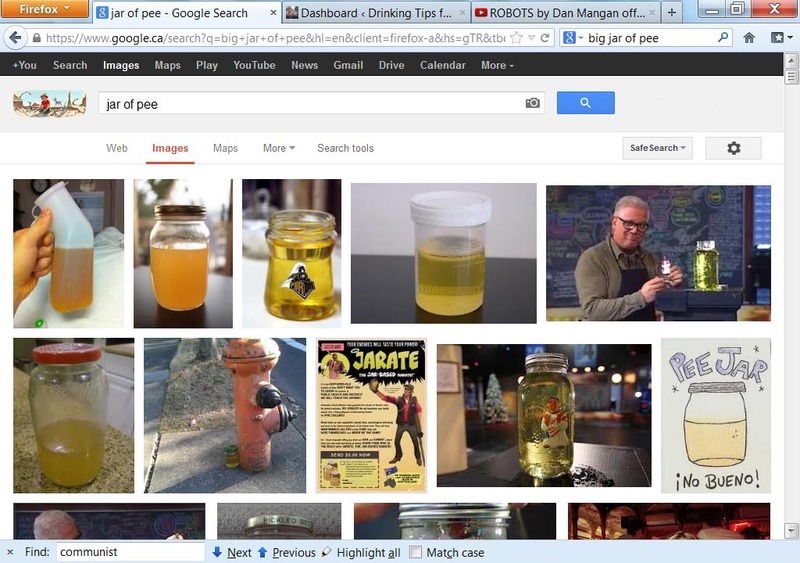 But over the years, I have never gotten over the unsettling nature of a big jar of pee. And it’s not just because of potential fridge-related confusion. “Don’t forget we have to collect your pee, Abby,” I told her this morning in preparation for her appointment tomorrow. I scrounged beneath the sink for an old spaghetti sauce jar, washed it out and, when Abby came out of the bathroom with her little margarine container, filled it with urine and stuck it in the fridge. There it will sit until we drive to Montreal and hand her big spaghetti sauce jar of pee over to a stranger who will in turn send it to a lab where someone will test it, which raises the question: how do you get that job? And is stool-sampling a promotion or a demotion? The big spaghetti sauce jar full of pee in the fridge. It’s just one of the many strange realities of Abby’s condition, a sickly yellow reminder of how unique and delicate she is, how grateful we are for the medical attention she gets and how hopeful we are that she won’t test too high for tyrosine or oregano. Want to play Fictionary? Visit Kylie. This entry was posted in It Really Did Happen! and tagged big jar of pee, family, Fictionary, genetics, humor, medicine, tyronsinemia. Bookmark the permalink. You’ve set the bar high, very high, indeed! Also, the link for the ‘precious bodily fluids’ was broken. OOOO, that’s a good one. Thanks, we’re stevened now. (adj. equal in a hurry, too quickly to even say ‘even-steven’). I’m going to share your post on FB. Thanks again for letting me know about the URL. So weird, since I swiped it from the browser window. Then was I was editing the post, the images disappeared for awhile. The whole game started to come crashing down!! Look at your post date. Somehow it says you posted it January 1. Weirdpress (when WordPress does things you can’t explain). Oh well–glad you found it early! When I read the title of your post, I was wondering what it was going to be about! And, well, it was exactly that 🙂 As odd as the routine may be, it’s wonderful that she’s getting the care she needs and that you are such a wonderful father. She’s a great kid, almost always happy and smiling, rarely complaining about the severe dietary restrictions she lives with every single day. Let me put it this way: teachers lover her. ‘Nuf said. I love it when kids show us how to live gracefully under all kinds of pressure and inconveniences. I often say I learn more from my daughter than I teach her. Sounds like you have a great daughter with a positive attitude. All my kids are great. Not just bias speaking; I just have to look around. Oh goodness. What an interesting post to read after your Teen Edition one! Abby sounds like a very strong, sweet girl. So glad she’s been good so far! She is. Thanks for the follow! Thanks for the “slice-of-my-life” post. You some kind of speed reader, man! Fictionary entry from the always Rosstastic Ross Murray at Drinking Tips for Teens. I love that fellow bloggers always seem to make me thankful. Now I’m thankful that I never had to collect pee from my little girl! The mechanics of trying to get it from a toddling girl is making me dizzy. I’m glad your daughter is doing so well! I’m not going to lie, there have been tears. But she’s a cool kid. Kylie, I’ve Adult Onset Diabetes. My doc usually needs a sample. I get the little jar go into the men’s room and freeze up. Before, Niagara Falls, after a trickle. Your post though on a serious subject has the potential for a bit of gentle humor. Performance anxiety is the pits. I hope your little girl Abby is found in good shape on her tests. Best wishes to you and your family. She gets great care and almost always gets a metaphorical gold star. Thanks very much, and best to you as well. Awesome – Very glad to hear that! We should have matched our kids up – Abby’s big jar of pee with my son’s bodily fluids from his stomas that were collected and refed (via a machine) thru his other stomas to his intestine! We’d have had gross out contest – of which, us as parents, would not be phased about. I’m glad to have read that Abby is doing well – and gets good care! Viva la healthcare! My french is suckage – sorry. It’s the thought that counts. And that’s no joke. Much good thoughts. I admire you that much more after learning about Abby and that you can still see the humor in things. I think that’s what helped me from going crazy when Dorian was in the hospital. He had jaundice (not the kind that lights can fix – but from complications with his liver and other things) and we’d spike his hair with gel and put him in bright yellow onesies b/c he looked so cute extra yellow! And all the other stuff that was going on – being able to see the humorous side to something possibly fatal worked wonders for my mental health. I think you’re so fabbo, Rosemary! Is that Russian for ‘descending colon’? I always say that if you don’t want someone to steal your lunch from the fridge at work, put it in a tupperware and label it ‘stool sample’. You could probably also trap a work fridge thief by pouring pee in an apple juice container and waiting to see what happens. The first is icky, the second might be a felony.